Just five days after its release, the official music video for Francesco Gabbani’s Eurovision entry Occidentali’s Karma reached more than 10 million views and more than 165.000 likes on YouTube. Additionally the betting agencies currently rank Italy as their main favourite to win the Eurovision Song Contest. After his surprising win of the Sanremo Festival on Saturday over fan favourite Fiorella Mannoia, Francesco Gabbani has become one of the main contenders to win the 2017 Eurovision Song Contest. The music video for Occidentali’s Karma has been watched for more than 10 million times world-wide after only five days since it’s release on Francesco’s official YouTube channel. According to the same source, the Italian entry further leads the Spotify charts within Italy and was the fourth most watched video worldwide on the 13th of February. 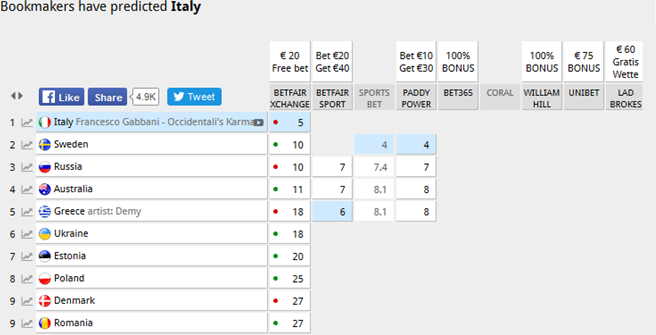 The odds of the betting agencies seem to confirm the fact, that Occidentali’s Karma has become one of the favourites to win the Contest and currently is ranked in first place. Of course, at this point it is not possible to predict a winner, as many songs haven’t been released yet. Nevertheless, high numbers of views and optimistic betting odds always are a good sign for every Eurovision entry. Below you can check out Francesco Gabbani’s official video and try your own prediction: Can Italy win the upcoming Eurovision Song Contest? Let us know on social media and in the comments. Since the comeback in 2011, Italy has been among the most succesful Eurovision countries and got a place in the Top 10 in 2011 (2nd), in 2013 (7th) and in 2015 (3rd). The last time Italy has been represented by a solo male vocalist was back in 2013, when Marco Mengoni placed 7th in Malmö. In contrast to this year’s entry, L’essenziale was a slow ballad, which was carried perfectly my the singer’s voice and emotions. Which song do you prefer out of Italy’s 2013 and 2017 competing tracks?